In this video guitar lesson I’m going to show you the fingerpicking pattern for the song “Home” by Phillip Phillips. Phillip Phillips was the winner of the 11th season of American Idol and “Home” was the final song he performed on the show. It then was released on his debut album “The World from the Side of the Moon”. The intro is just 2 chords. A C and a Csus4 chord. Here is the guitar tablature for the into to “Home” from Phillip Phillips. The acoustic guitar intro for the song uses a fingerpicking style called “Travis Picking“. Named after country guitarist Merle Travis. The whole right hand fingerpicking pattern is played 2 times for each chord. Each measure is really playing the whole travis picking pattern 2 times in a row. A good way to get a handle on the fingerpicking pattern for “Home” is to start with just the bass notes that you will play with your right hand thumb. You are just going to alternate between the 5th and the 4th strings. The idea of alternating bass notes is the whole idea behind Travis Picking. Next you are going to add in your right hand 2nd finger on the 2nd string at the same time you are playing 2nd bass note of the pattern. 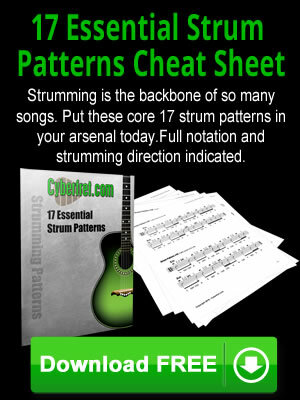 Again you are playing the whole travis picking pattern 2 times for each chord and each measure. Playing a bass note and melody note at the same time in a fingerpicking pattern is sometimes referred to as a “pinch”. Then finally to get the whole fingerpicking pattern for “Home” you are going to add in your right hand first finger right before you play the bass note on the 4th string the 2nd time. Here is a little inspiration for you. It’s the music video for the song. Below is a PDF file you can print out for this guitar lesson with the tablature and chord charts. Have fun playing the fingerpicking pattern to “Home” from Phillip Phillips.